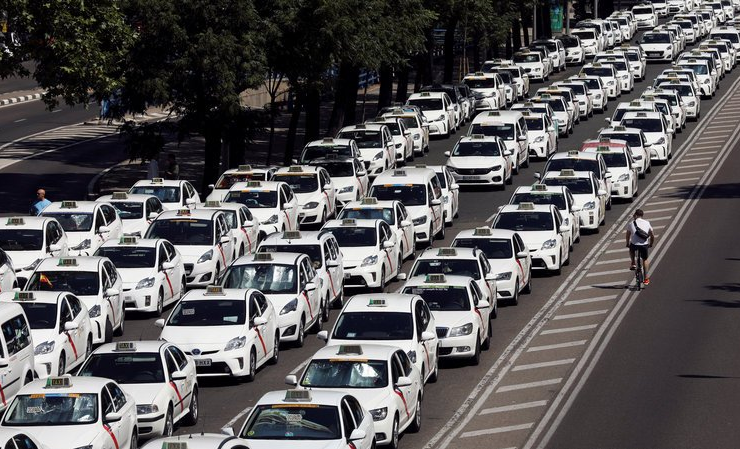 Just like many other major developed countries, Spain is living its Uber protest moment as striking taxi drivers have blocked important roads in the capital Madrid and various other major cities. Their concern lies with Uber and other ride-hailing apps who are stealing their bread and butter. The only difference with other European strikes of this size is that, firstly, the action is already entering its fifth day and, secondly, it falls smack in the middle of the busy tourist season, trapping many in their hotels. Western European tourists returning to their respective countries as July turns into August and some vacations come to an end as others are beginning, start to panic when they realize on their last or first day that airport exits are blocked and Madrid and Barcelona are unable to offer taxi services, leaving many stranded. European airlines have started sending frantic messages to their customers to arrive at least three hours before departure and count on public transport to get to the respective airports. The last highway exit before the airports of cities like Sevilla, Malaga, Pamplona and Bilbao are all blocked off, enforcing tourists to walk the last few kilometers luggage and kids in hand to the terminals, making for some rare sightings and long lines at the bus terminals. Just as in France and Belgium, who’ve seen similar strikes before, it has now become known that Spanish taxi drivers need to ‘unofficially’ purchase their license to operate from the company before they can start driving. The costs for these licenses runs near $100,000 in cities like Barcelona and Madrid, making it hard to compete with cheaper alternatives like Uber and Cabify as you are trying to recoup your investment and see your rides get ‘stolen’. In Spain, the anger of the taxi drivers is directed against ride-hailing apps which are supposed to receive 1 license per 30 taxis (there are tens of thousands of taxis in the major Spanish cities). However, according to the striking unions, this level is no longer tenable as Uber drivers are passing their licenses amongst each other, making it hard for the police to control. The strike began in Barcelona and then spread onto Madrid. By now it has reached all major cities. Now in its fifth day, it forms quite the test for the leftwing minority government of Socialist PM Mr Pedro Sanchez. If he wants to deliver a workable agreement, he will need the help of other political parties on the right, who would like nothing more than a reason to call elections as the socialists are trailing in all political polls. If he doesn’t deliver an agreement soon, the strike will block airports, city centers and even ports, smack in the middle of the busy tourist season.